I became a fan of The Smashing Pumpkins the minute I heard “Drown” (or was it, “Cherub Rock?”), and as such I have followed the work of Billy Corgan throughout the lifespan of that band, not to mention his endeavors both with Zwan and on his own. Though I scoffed at the irrational backlash that accompanied the 2005 reunion sans James Iha and D’arcy Wretzky, I still have to concede that 2007’s Zeitgeist was the weakest Pumpkins release ever, and perhaps the worst album of Corgan’s career to date. The commercial failure of that record and the recent departure of longtime drummer Jimmy Chamberlin raised questions regarding the band’s future, though Corgan seems to have pulled a Page Hamilton (or perhaps an Axl Rose), carrying on with hired guns and invited guests. 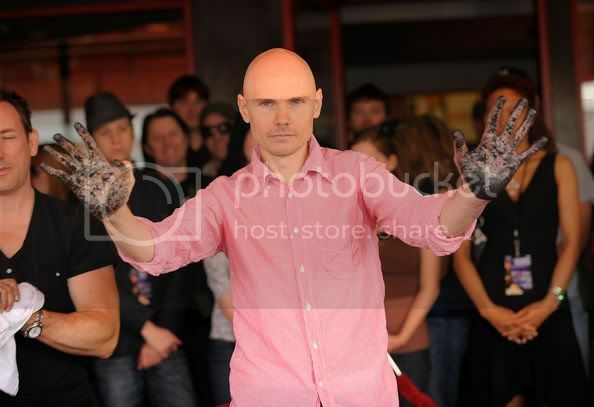 For you see, he now intends to release 44 new Smashing Pumpkins songs online for free. In the words of my beloved Internets: DO NOT WANT. Recording began yesterday, September 15th, 2009 on the new record which will be entitled ‘Teargarden by Kaleidyscope’. The album will feature 44 songs, 4 of which are now being recorded. My desire is to release a song at a time beginning around Halloween of this year, with each new release coming shortly after until all 44 are out. Each song will be made available absolutely for free, to anyone anywhere. There will be no strings attached. Free will mean free, which means you won’t have to sign up for anything, give an email address, or jump through a hoop. You will be able to go and take the song or songs as you wish, as many times as you wish. In light of the lackluster Zeitgeist, the very thought of Teargarden by Kaleidyscope fills me with dread. As my dear friend Svenllama opined on his Twitter account, it’s “the answer to a question nobody was asking.” I guess Corgan figures that he’s a rockstar with brand recognition on par with Radiohead and Nine Inch Nails, two artists who’ve spearheaded and at least initially defined the slowly evolving online release model. (Credit, however, should be given to Corgan for perpetrating one of the earliest free album releases back in 2000: Machina II: The Friends & Enemies Of Modern Music.) Like those bands, Corgan also intends to offer a physical product for the collector’s and Ebay entrepreneurs, promising “highly limited edition EP’s (of 4 songs each times 11)” that “will be more like mini-box sets rather than your normal cd single,” as well as a culminating “deluxe box set” once all of the songs have been released. Like it or not, this is becoming the business plan for legacy acts jaded by years of major label bureaucracy and restrictive contracts. Kudos to Corgan for following suit, but you’ll forgive me if I pass on the “mini box sets” and opt instead to download the digi-freebies and delete at will.